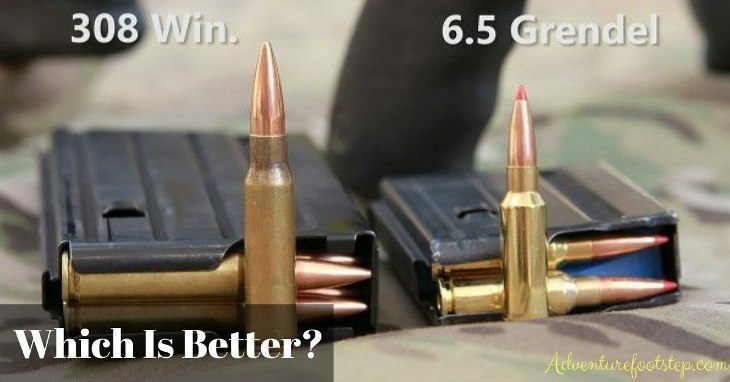 →6.5 Grendel Vs. 308: Which Is Better? Grendel 6.5mm (6.5 × 39mm) is an intermediate cartridge with a size of 6.5 x 39 mm. The bullet is designed exclusively for AR-15 with high accuracy and low recoil. Meanwhile, the 308 is for civilian hunting, target shooting or snipers. The shell of 308 is relatively short, making it well adapted to quick action rifles. While 308 was designed in 1952 for a semi-automatic military rifle, the 6.5 ammo was born in 2007 for long range targets. Whether 6.5 Grendel or 308 is better has long been an intense debate. Let’s have a comparison between these two to find out the answer! The 6.5 Grendel is lighter than the 308, which means it is more convenient to carry the rifle around for hours. However, the difference in weight between them is just several pounds. In case you want to get something on the AR platform that is great for taking a medium-sized game like hunting deers, the 6.5 Grendel is an ideal solution. When it comes to stability, the 6.5 Grendel is better since the bullet is adapted to the standard-sized AR-15 rifle. With an AR platform, all you need to do is popping the two pins and putting a 6.5 Grendel up or on. Meanwhile, if you go with the 308, you will have to get a whole new weapon. Since an AR-15 is shorter with the same barrel length, the balance is considerably better. The 6.5 Grendel, at just $0.28/round, offers a better price than the 308. We recommend you to buy a 6.5 Grendel rifle from Alexander Arms, which tends to be less expensive than most of 308 ARs with similar quality and configuration. The products from this brand have strictly high-quality components and build. In case you already have an AR-15 Grendel rifle, you will only need to purchase an upper and magazines. When all above criteria seem to be equal, a short barrel is more accurate, mobile and well balanced than a longer one. For ordinary hunting purposes, we recommend 18 as the actual maximum length for a Grendel rifle. A 16 or shorter barrel is not a bad choice for most hunters. When it comes to this criterion, the 6.5 Grendel significantly surpass the 308. Since the 6.5 is a specialized round for AR-15 that takes advantage of modern powder and cartridge design, it is very efficient when being shot from a short barrel. The 6.5 Grendel has a better advantage over the 308 in actual gun length, which helps the shooting achieve rapid speed. 6.5 Grendel bullets weigh less and need less space than the 308. The difference may seem trivial, but it can be a real advantage for extended hunts, in which weight is strictly restricted. Also, being lightweight can save considerable space. For example, I once participated in a hunt which we have to go on the buoys. The trip required us to bring only essential equipment. We had to get rid of many things including some of our bullets to avoid weight restrictions. In such a case, the 6.5 Grendel does help since it is lighter than other ammunition including 308. Recoil is always one of the critical factors related to guns. It is one of the main reasons that cause fatigue for shooters and degradation of accuracy. The severity of recoil also varies depending on the experience of the shooter. Recoil slows down the acquisition of targets. The 6.5 Grendel has significantly lower recoil than the 308 although it is the lighter rifle of the two. The ballistic terminal is a term which refers to the way the Grandel performs once it strikes the target. The sectional density significantly affects the ballistic end of a bullet. A bullet with a smaller, lighter diameter can expand and penetrate better than a larger caliber bullet with less cross-sectional density. This effect is the result of the shape that forms the weight of the bullet. For a 308 to have the same cross-sectional density as 6.5 cartridges, it would have to be longer and heavier, which degrades its performance when hitting the target. Let's take a quick look at the spreadsheet and compare 6.5 Grendel and 308. When we look at muzzle velocity, the 6.5 is a little bit slower than the 308 when shooting at a distance of one hundred yards. However, the velocity of 6.5 starts catching up that of 308 at 200 and 300 yards. At 400 and 500 yards, the 6.5 Grendel surpasses the 308 in speed, and this result is going to continue with the further distances energy. When it comes to muzzle energy, we have 1800 versus 2600 at the muzzle. That's a pretty big difference since there are almost a thousand foot-pounds of energy. That is what a lot of people refer to as the stopping power. However, it does not do you any good if the bullet goes all the way through. At 100 and then 200 yards, the muzzle energy of the 6.5 starts getting closer to that of 308 ammo. This tendency is the same as we get further in the distance as the 6.5 catches up with the statistics of the 308. What this means is the velocity and energy of 6.5 ammo gets better than that of 308 when shooting at further distances. If your target is at a long distance, remember that the 6.5 Grendel is a great long-range cartridge. Also, the 6.5 brings a more significant amount of muzzle energy, which enhances the shots at longer ranges. As we can see, based on the ballistics, the 6.5 Grendel is better than the 308. However, pointing out which is better does not only depends on the statistics. In comparison with 6.5 ammo, the 308 is more common for camp hunting. This cartridge is capable of taking any target at distances that most people hunt. Therefore, if you are looking for a suitable cartridge for your regular range hunting rifle, you should choose the 308 over the 6.5 ammo. On the other hand, for long range target shooting, the 6.5 Grendel should be your choice.